Our all natural Bulk Beeswax Yellow Granules are characterized by their golden yellow color and naturally mild sweet aroma. 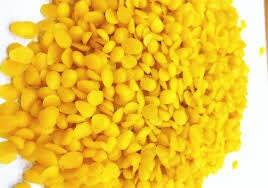 The Bulk Beeswax Yellow Granules are filtered to be free of debris. The cleanliness and small size of the Beeswax Yellow Granules contribute to the product’s ease of use. Melting point of 143 to 148 degrees F. and should only be heated using a double boiler as it is flammable when subjected to fire and flames. It is pliable at 100 degrees F.